Grab Your Bazooka and Double your Bubble fun, it's time to remember the good old days of bubble gum cigars, Bazooka Joe and Double Bubble Comics. 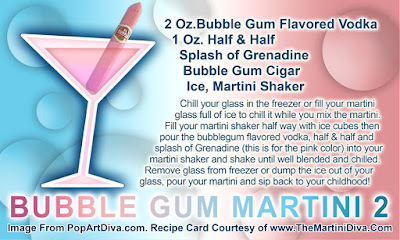 Here's two really fun, playful martinis if you're inclined to sweet drinks, and they do have that haunting taste. My first recipe is made with vodka, peach schnapps and cola. 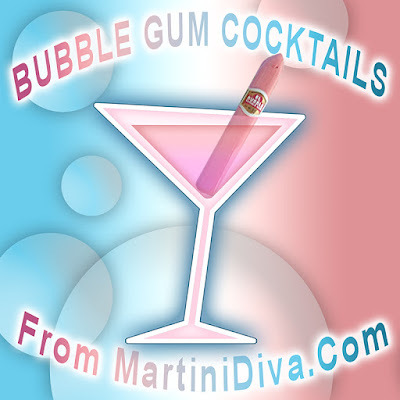 After Three Olives came out with it's bubble gum flavored vodka I did a remix with some half & half for a creamy version I called the Bubble Gum Martini Opus Two. These would be really fun for a baby shower party. Grenadine will make them pink or you can leave out the grenadine and color them blue with some butterfly pea flower powder or essence or some food coloring. 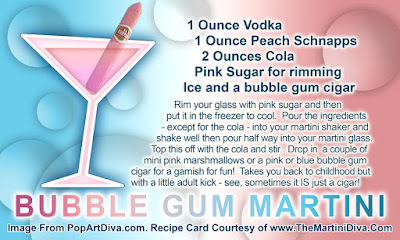 Garnish with a matching bubble gum cigar.